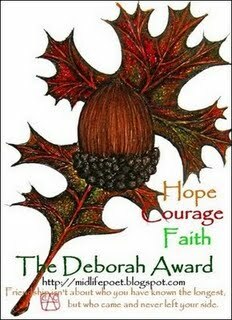 Diane so graciously awarded the Deborah award to me today on her blog. Little does she know that it was a great morale booster to me. I’m going to buckle down and try to reach a certain goal by the end of the year and this evening I’ve been really stressing about what I need to change to make it happen. I know I’ll probably feel much better after I get some sleep, so I’m trying not to worry too much about it. So, Diane thank you for the award and for your friendship and support during this weightloss journey of mine. That award is so PRETTY. I find it so hard to pass awards. You want to give them to everybody. Any weight gain from the holiday? I was happy to see only about half a pound, after the post-Thanksgiving bounce. Half a pound is not so bad. I'm glad you liked the award. I so enjoyed the thought behind it, and loved the lady's blog that created it. Very affirming. Take care Leah – I hope you are doing well!